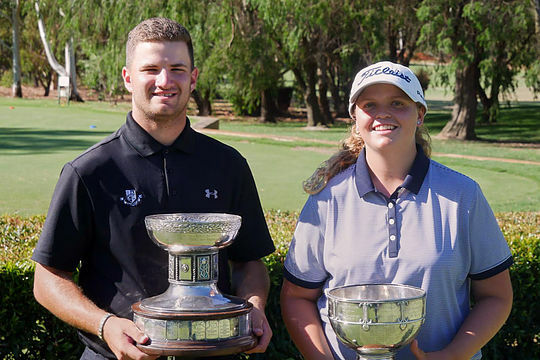 Azer Pehlic and Kirsten Rudgeley, both of Mount Lawley Golf Club are now proud holders of the 2019 WA Amateur titles after an exciting weekend of golf held at Wanneroo Golf Club. Spectators witnessed a slice of history as Mount Lawley Golf Club produced both winners, a first at the Championships. The Men’s final was a tight tussle between Pehlic and Haydn Barron (WAGC) across 36 tough holes of golf. Pehlic and Barron both held 1up leads at various stages throughout the first 18 holes, but neither was able to break away from the other and the second 18 holes of the day were no different as it came down to the wire. Norris soon stumbled with three back to back bogeys and a birdie from Rudgeley on the 27th hole shot her lead back out to a commanding 6up with Rudgeley eventually taking the victory 5&4.